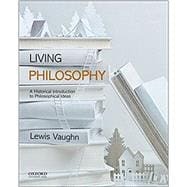 Lewis Vaughn is the author or coauthor of numerous books, including Philosophy: The Quest for Truth, Tenth Edition (2016), Bioethics, Third Edition (2016), The Power of Critical Thinking, Fifth Edition (2015), and Philosophy Here and Now, Second Edition (2015), all published by Oxford University Press. Each chapter ends with Writing and Reasoning, Review Notes, Key Terms, Notes, and For Further Reading. Then and Now: Is the United States a Socialist Country? Charles Sanders Peirce: "How to Make Our Ideas Clear"
William James: "The Will to Believe"
Then and Now: Innate Gender Differences? Louis M. Antony: "Embodiment and Epistemology"
Jan Crosthwaite: "Gender and Bioethics"
Annette C. Baier: "The Need for More Than Justice"
Elizabeth Anderson: "Feminist Epistemology and Philosophy of Science"
17.6 Martin Luther King, Jr.
Martin Luther King, Jr.: "Nonviolence and Racial Justice"
Martin Luther King, Jr.: "Letter from a Birmingham Jail"
* Details: Is Religion Necessary for a Meaningful Life? * Julian Baggini: What's It All About?